Sometimes it's not about coming out, it's about settling in. Eighteen-year-old Bradley Collins came out a year ago and hasn't looked back since. Who cares if he doesn’t know any other gay people? Bradley has friends and basketball—that’s all he needs. Even if that means always sitting on the sidelines when the guys go out looking for girls. When cute film-boy TJ tries to flirt with Bradley while his friends are doing their thing, he freaks. Yeah, he’s gay, but he’s never had the opportunity to go out with a boy before. He’s never had to worry about how his friends will react to seeing him with a guy. Bradley accompanies TJ on a road trip to film TJ’s senior project documentary. In each city they visit, they meet with people from different walks of life, and Bradley learns there’s a whole lot more to being honest about himself than just coming out. He still has to figure out who he really is, and learn to be okay with what he discovers. The History of Us by Nyrae Dawn was a powerful, poignant, real, and though provoking story. It gives us a clear look in to the thoughts and feelings of eighteen year old, Bradley Collins. Bradley has been best friends with Chase, Jabbar, and Marcus since Kindergarten. They are an extremely close knit group, and are all on their high school's basketball team. Bradley came out to his friends and his mother, his sophomore year of high school. Now, he is a senior in high school and has never had a boyfriend, shared a kiss with a guy, or even found a guy that he was interested in. At times, Bradley feels lonely and left out with his friends. When they flirt with girls, or go out in a group to date, he prefers to hang back. One day, when his friends go to an arcade/coffee shop that they frequent, Bradley notices the cute guy that he see's around every once in a while. Bradley is attracted to him, but would never make a move. When they guy approaches Bradley, he introduces himself as T.J. and tries to pick up on him. Bradley is embarrassed, and responds rudely to T.J. However, he eventually apologizes, and they begin to hang out without Bradley's friends being made aware. Even though Bradley has admitted to being gay, he is still not comfortable in his own skin. He worries about what other people think of him, doesn't like feeling different from his other friends, and doesn't know how to move forward. Bradley's mom stands strongly by her son's side and wants him to be happy. She see's him struggling, and when he tells her about a road trip that T.J. is going on, she encourages him to accompany T.J. The decision to go on the road trip is the beginning of an eye opening, soul searching experience, where both Bradley and T.J. learn about themselves as they interview a variety of gay couples, from different walks of life, and with various experiences and points of view. The History of Us was a story that touched my heart. I cried for Bradley, and my heart broke for T.J., as well as those couples that were in horrible emotional pain. The theme that was beautifully woven throughout the story was that first and foremost, we are all people. We love, we endure painful loss, we struggle with who we are, we crave acceptance, and if we want something badly enough, we need to work and fight hard for it. Life isn't always fair or easy, but if you surround yourself with good people, they can help you through those tough times. The History of Us was a story full of depth, and reflection. It impacted me deeply and I loved how Ms. Dawn spoke about derogatory gay stereotypes, as well as made me feel for and relate to these characters as people. It was eye-opening, profound, and compelling. I give, The History of Us, by Nyrae Dawn, 4.5 Touching, Enlightening, and Authentic Stars! 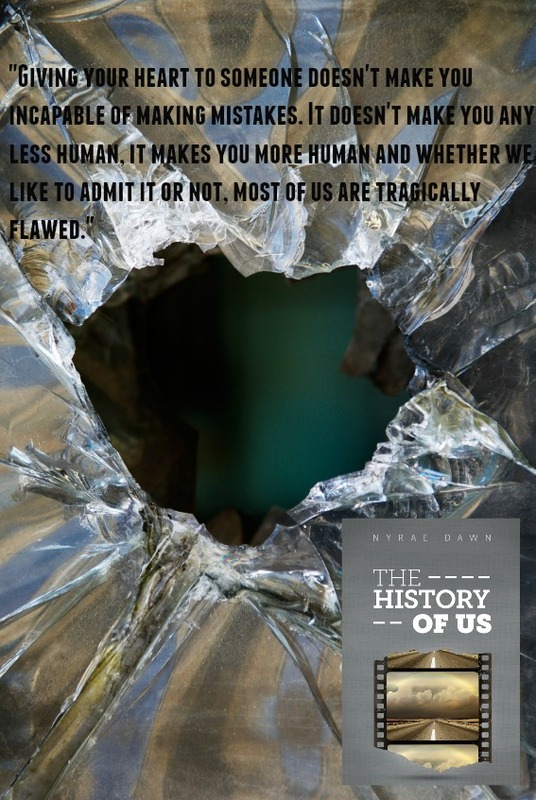 The History of Us, by Nyrae Dawn, is a wonderfully written story of first love, learning how to become your authentic self, letting go, and becoming a giving, and loving human being. This story is filled with life lessons, wonderful characters, and an honest look at how being different from the norm can leave you lonely, hopeless, and sometimes suicidal. Bradley Collins has been out to his mother and his closest friends for quite a while. It's easy, they are all accepting of him. It's uncomplicated, and honest, he thinks. In actuality, Bradley is living a lie, because he hasn't tested the limits. He won't allow himself to push forward into a relationship with another guy, because then he will have to see how his friends react, and test the bounds of their true feelings. T.J. Bennett comes from an affluent family. He comes across as self-assured, beaming with confidence, and as angry towards anyone who can't be who they really are. One day, he approaches Bradley. As T.J. attempts to flirt, Bradley shoots him down in front of his friends. T.J. is a gorgeous young guy, with spiky hair, and beautiful piercing blue eyes. Bradley is the school basketball champ. They are both attracted to each other, but Bradley lets fear hold him back. With the encouragement of Bradley's mom, he finally apologizes to T.J., and asks to accompany him on his road trip, so that he can get to know someone that is like himself. This is Bradley's first time stepping out of his comfort zone, and it takes him a while to let go of all his fears, and just let life happen. The two leave for an extended two week trip, meeting people with original stories of their challenges, obstacles, pain, and loneliness in their journey through their private life experiences of being gay. This is an eye opener for Bradley. He finally starts evolving, realizing that he has nothing to be ashamed of, and this allows him to open up to the experience of love for the first time in his life. 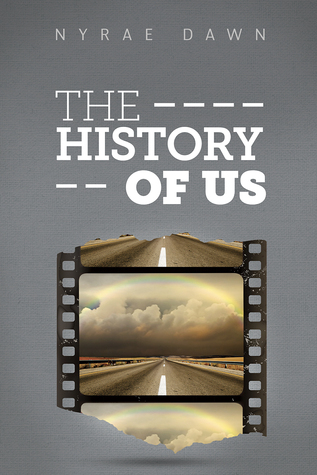 The History of Us, by Nyrae Dawn, was a Beautifully written, painstakingly carefully written novel. There is nothing over the line, or offensive, in this well written YA novel. It does however have a lot of say to the youth today, and will teach family and friends how important their role is in their children, friend, and/or sibling's journeys. I give, The History of Us, 4, Eye Opening, Life Changing Lessons, New Love Stars!!! Writing has always been Nyrae Dawn's passion. Nyrae gravitates toward character-driven stories. She loves going on emotional journeys with characters whether it be reading or writing. And yes, she's a total romantic at heart and proud. Nyrae resides in sunny Southern California with her husband (who still makes her swoon) and her two awesome kids. When she's not with her family, you can be pretty sure you'll find her with a book in her hand or her laptop and an open document in front of her. Nyrae also writes adult romance under the name Kelley Vitollo. This one seems like a tear-jerker. Glad that y'all liked it. I would hate to not know who I was in my own skin. I hope you read it Lauren. It was a really powerful story. I'm following your LGBT blog through bloglovin"
Aw, I love me a good emotional book and this sounds right up my alley! Then You will enjoy this one! This really does sound like a powerful read. And journey is the right word for it. Thanks for sharing. I read one other of her books and it was an emotional hitter. This one looks really good, too. It was! Nyrae Dawn is one of my favorite authors. I just love the way that she makes me connect with her characters, and touches on the realities of life.